Alphabet City is a community art space that celebrates printing and words. We provide space and resources for anyone excited by letterpress printing, bookbinding, zines, printmaking and book arts. We host workshops, events, idea exchanges, exhibitions and we’re home to the Alphabet City Zine Library. We opened in June 2011 with the first meeting of the Auckland Letter Writing Club and have been welcoming people ever since to work on their projects and explore old technology. Alphabet City is named after a bustling diverse neighbourhood east of the East Village in New York City. Alphabet City is open by appointment and for events. We have two letterpress printing machines in house : an Adana 8 x 5 platen press and a Farley proofing press. We’re home to many cases of metal type and ornaments, and an assortment of wood type. 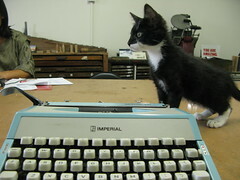 We have nearly two dozen typewriters, including one that types in script and one that types in Cyrillic. We also have an extensive large selection of rubber stamps, collage fodder, long-arm staplers, DIY bookbinding materials, lino cutting materials and almost anything else you may need to create zines and artists books. The Alphabet City Zine Library is home to nearly 2,500 self-published volumes. Who is behind Alphabet City? Co-directors Erin Fae and Moira Clunie have been involved in zines, mail art, book arts and letterpress for over a decade. Alphabet City is at 71 Mt Eden Road, Eden Terrace, Auckland, New Zealand. Alphabet City is in part funded by a generous grant from Auckland Council. We are honoured to be the recipients of the Community Group Accommodation Support Fund, which aims to provide financial assistance to community groups and organisations to help meet accommodation costs. Thank you Auckland Council! Alphabet City is a community art space in Eden Terrace, Auckland that celebrates printing and words.